Home › Announcements › The Aurora Borealis Now Online! The Aurora Borealis Now Online! Thanks to a partnership with the Aurora Colony Historical Society and Museum of Aurora, Oregon, issues from May-December 1908 of the town’s historic newspaper, The Aurora Borealis, are now available for keyword searching and browsing at Historic Oregon Newspapers online! Founded as a Christian communal colony in the 1850s, Aurora was populated by several hundred members of the Bethel Colony in Missouri, mostly German and Swiss immigrants, led by founder Wilhelm Keil across the Oregon Trail. Despite hardships in the new frontier, Aurora colonists thrived until Keil’s death in 1877 and the subsequent dissolution of the colony, which is now incorporated as the City of Aurora. 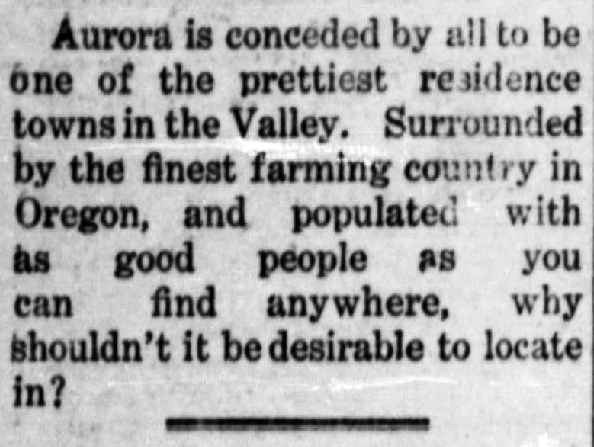 Explore the many articles, advertisements, and other interesting tidbits that The Aurora Borealis has to offer, and discover Oregon’s history at Historic Oregon Newspapers online. ‹ Hillsboro Now Represented on Historic Oregon Newspapers Online!